Look who's back to visit this Friday??!!! He's been working hard in Brussels but just couldn't visit Beirut without arranging a gig! 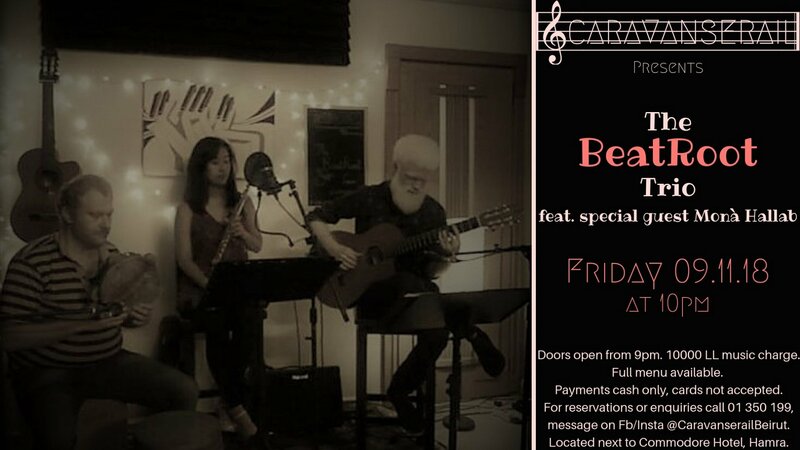 Joe Aouad is back in town for a short trip and has gathered together his BeatRoot Trio fellows Rami Al Jundi and Nobuko Miyazaki to play at Caravanserail! For those of you lucky enough to have seen that at one of the intimate RedHouse Sessions last year you will know that BeatRoot have an unrecognisable style playing some of their own compositions along with their renditions of some middle eastern classic muwashahat. With guitar, percussion and beautiful flute, the trio will be joined by special guest vocalist Monà Hallab. What an incredible line up! 10000LL music charge and full menu available (plus the bar, of course!). Please note that Caravanserail is a cash only venue and regret that we are unable to accept card payments. We are located just next to the Commodore Hotel in Hamra, just a few moments walk from Hamra Street.